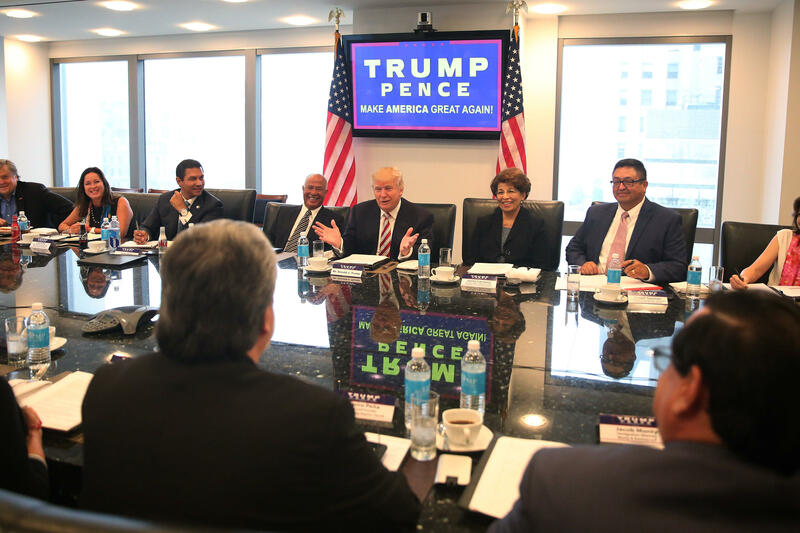 Republican presidential nominee Donald Trump and his campaign team met with Hispanic faith, civic and business leaders Saturday in New York, the first announced convening of the National Hispanic Advisory Council for Trump. The Republican National Committee (RNC) also joined in the meeting at Trump Tower, which included nearly two dozen members of the Hispanic community from 12 states and which discussed strategies on outreach to Latino voters. Several attendees had ties to the evangelical community -- a typically reliable, strong font of Republican support. Trump appeals to black voters: What do you have to lose? “[T]heir contributions will help us compete for every vote in every community all the way through Election Day,” Priebus said. Trump has failed to make much headway among Hispanic voters, many of whom have felt alienated by his immigration proposals and his inflammatory rhetoric against Mexican immigrants. His meeting with Hispanic leaders comes just as new poll numbers show Trump trailing far behind general election rival Hillary Clinton among Latinos nationwide. One poll, published by Fox News Latino last week, found Trump lagging behind by a 46-point margin, 20 percent to the Democratic nominee’s 66 percent. On Friday, the billionaire candidate also came out with his first general election television ad hitting Clinton over immigration policy. In the 30-second spot, Trump darkly paints Clinton’s America as one where “illegal immigrants convicted of crimes get to stay, collecting Social Security benefits, skipping the line. Our border open.” The Washington Post’s fact-checkers gave at least one of the ad’s central claims -- that undocumented immigrants are “collecting Social Security benefits” -- a rating of “Four Pinocchios” for the false statement.